Oakland Upholstery Cleaning removes visible and invisible signs of wear and tear from your sofas, chairs and other upholstered surfaces. The result is longer lasting, better looking and better smelling furnishings. Professional cleaning makes all upholstery furniture look better. It removes all body oils, food, dirt and dust, which affect the appearance, smell and overall life of upholstery. No matter if it's fabric made of natural fibers, synthetic, leather or a leather-substitute, even if plastic. Upholstery Cleaning Oakland knows that simple vacuuming and fluffing of the pillows will not be enough when it comes to really cleaning your furniture. Professional Upholstery Cleaning doesn't require to completely disassembling the furniture. However, it is necessary to remove all pillows and cushions and to move furniture that typically stands against a wall. During the cleaning process, all surfaces, including the base, the back, pillows and cushions, are vacuumed with Oakland Upholstery Cleaning, industrial strength equipment. At this time, upholstery brushes are also used to gently loosen any embedded dirt, dust or other materials. Then, the upholstery is tested and inspected. This 'discovery' stage is very important in determining exactly what products and what cleaning method is appropriate and safe for your particular upholstery. Stains are pretreated, as necessary. If required or requested, repairs are made. If there is any uncertainty regarding upholstery origin, spot-testing of product is carried out before cleaning begins. We use truck mounted units, to methodically clean the upholstery. Using a hand-held tool, Oakland Upholstery Cleaning experts meticulously go over every part of the upholstery, extracting all pollutants. The extraction method is a low-moisture method that utilizes hot-water, and it is not appropriate for all upholstery types. 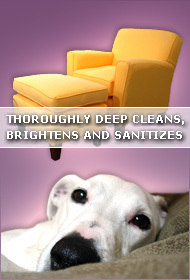 An alternate method of upholstery cleaning is used in such cases. Drying time will vary depending on outdoor weather conditions, indoor ventilation and other factors. In most cases, drying takes no more than a few hours. In some cases, however, Oakland Upholstery Cleaning crew will bring in air movers or fans to facilitate quicker drying. Call UCM Services Oakland 510-999-8920 and save the cost of replacing your upholstered furniture. Our Estimates are always free.